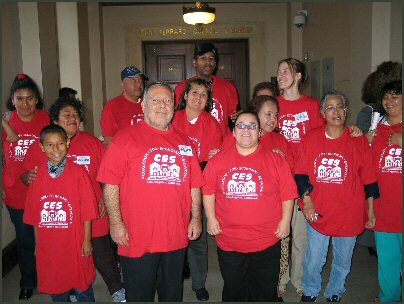 On November 26, 2013, the Los Angeles City Council unanimously voted to extend the Foreclosure Eviction Ordinance protecting tenants living in foreclosed rental properties and not subject to the City's Rent Stabilization Ordinance (RSO) from eviction for another two year. HUD Tenants at Villa Yucatan Apts in Pasadena Meet. CES HUD Tenant Leaders Met at Villa Yucatan Apartments in Pasadena, to discuss building issue concerns and strategize on proposals to present to management regarding maintenance and ways to improve the cleanliness of the building's common areas. 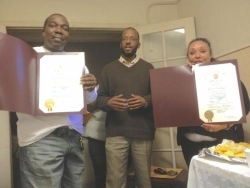 CES HUD Tenants Get Award from City of L.A.
CES HUD tenant leaders from Casa Longwood Apts, Ennis Beley & Maritza Roque, received awards from LA Mayor Eric Garcett & City Council President Herb Wesson at the Nov 20th Friends of West Adams Association meeting for their hard work and dedication in serving their community. Council President Wesson's Field Deputy, Kimani Black, was on hand to present the award. 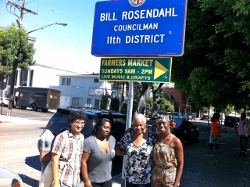 The tenant leaders both played key roles in the creation of the community block club, Friends of West Adams Association, whose mission is to make their neighborhood a safer and better place to live. 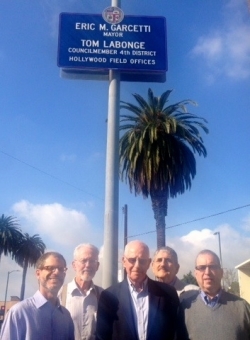 The association's activities have included calling on the LA Police Department for more area patrols, improving neighborhood street lighting and organizing a community cleanup. 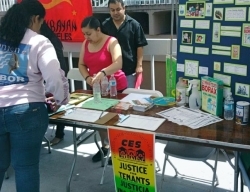 Following up on their successful October 1 forum on the elevator problems where some 200 angry Park La Brea tenants showed up, tenant leaders have been busy at organizing assisted by CES. Since that meeting tenants established Renters United at Park La Brea (RUPLB) to develop a campaign to ensure there are safe and working elevators. Congresswoman Maxine Water (D-LA) responds to a question on the impact of Sequestration on housing and low-income Section 8 tenants from Coalition for Economic Survival Executive Director Larry Gross at the Bipartisan Policy Center Housing Forum at the University of Southern California on November 4, 2013. CES/LACATH Tenant Organizers attended a National Alliance of HUD Tenants training in Arlington, VA on March 15, for organizers from 13 groups around the country that received HUD Tenant Resource Network Program grants to outreach, empower and organize tenants to preserve their at-risk HUD subsidized affordable housing. 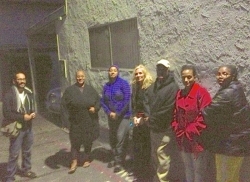 The Los Angeles Center for Affordable Housing (LACATH), a project of CES, is one of the grant recipients. 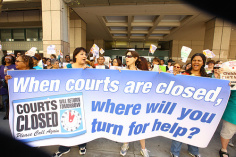 Los Angeles Superior Court’s closure of 21 of its 26 courtrooms for eviction hearings illegally "shuts the courthouse doors on many of the county’s most vulnerable residents" community organizers claim in a federal lawsuit, which CES is a plaintiff in. 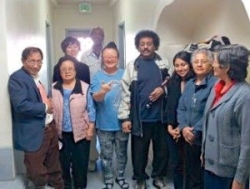 CES Organizers Meeting With Tenants Living in a Koreatown Area At-Risk HUD Subsidized Housing, Advising Them on Their Rights & Steps They Need to Take to Preserve Their Affordable Housing. The Meeting Was Held in Spanish, Korean & English With 2/3 of the Tenants in the Building Attending. At the time many people are preparing to enjoy the holidays, the magnificently talented performers of Cirque du Soleil's show "Iris" are unfortunately facing the loss of their jobs. It was recently and unexpectedly announced that the show would be closing on January 19, 2013. 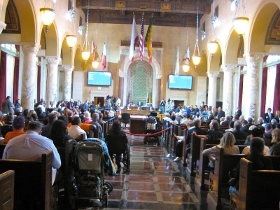 The L.A. City Council unanimously voted on December 14, 2012 in support of an ordinance introduced by Councilmember Paul Krekorian, in response to CES’ urging, to prohibit landlords from demanding that their tenants pay their rent only online. 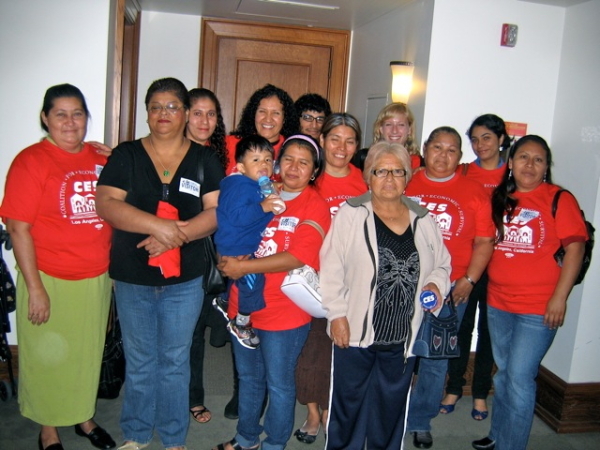 Crucial Tenant Foreclosure Eviction Protections WON! 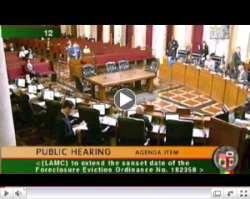 On December 11, 2012, the Los Angeles City Council unanimously voted to extend the City's Foreclosure Eviction Ordinance to protect tenants living in rental properties not subject to the City's Rent Stabilization Ordinance (RSO) from eviction on the grounds of foreclosure for another year. This Ordinance prohibits lenders from evicting any tenants in the City merely because of foreclosure on their landlords. Tenants living in rent controlled units have had these protections. 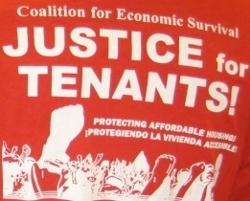 Tenants in California are on the verge of a tremendous victory in securing important rights. 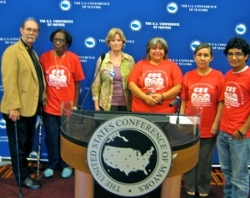 Earlier this year, after reading the Coalition for Economic Survival's E-Newsletters regarding CES' efforts to organize tenants in 34 apartment complexes owned by Jones and Jones Management Company throughout Los Angeles to oppose their landlords demands for their rent to only be paid online, California State Senator Ted Lieu (D-Torrance) responded by taking decisive action against this abuse. 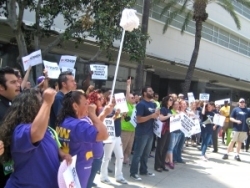 Various labor unions and community groups, including CES, demonstrated outside a Walmart store at Baldwin Hills Crenshaw Plaza in South Los Angeles to demand higher wages, guaranteed health insurance and Walmart's promise that it will invest profits in communities. 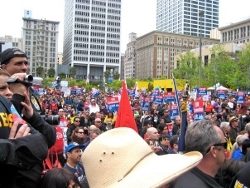 The rally, sponsored by the United Food and Commercial Workers (UFCW) and Warehouse Workers United took place on Thursday, April 19. 2012. CES tenant leaders Faviola Ruiz & Saul Ruiz staff a table with information on CES' healthy homes, childhood lead poisoning prevention and tenants' rights work at Cal State University Dominguez Hills 4th Annual Labor, Social and Environment Justice Fair held on April 19, 2012. Over 50 community and labor group participated in the event whose theme was "Together We Are Unstoppable...Another World is Possible." 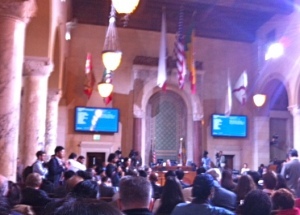 The L.A. City Council's Housing, Community Economic and Development (HCED) Committee unanimously voted on April 16, 2012 in support of a motion by Councilmember Paul Krekorian and seconded by Council Member Dennis Zine to prohibit landlords from demanding that their tenants pay their rent only online. 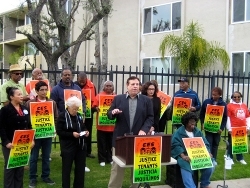 On March 6, 2012, the Coalition for Economic Survival (CES) organized a news conference to announce that a lawsuit has been filed the day before in Los Angeles County Superior Court against Jones and Jones Property Management Company on behalf of tenants who are illegally being required to pay their rent only online. 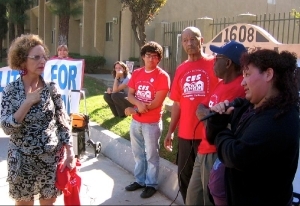 After reading CES' E-Newsletters regarding our efforts to organize tenants in 34 apartment complexes owned by Jones and Jone Management Company throughout L.A. to oppose their landlords demands for their rent to only be paid online, California State Senator Ted Lieu (D-Torrance) responded by taking decisive action against this abuse. 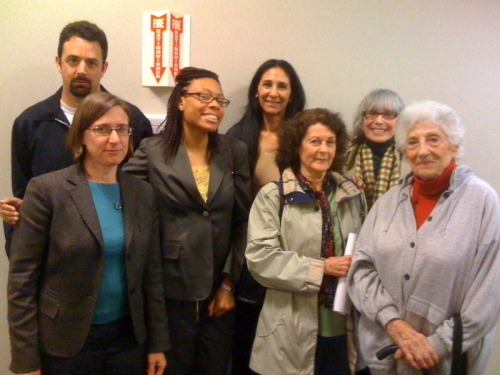 Crucial Tenant Protections for Foreclosure Evictions WON! 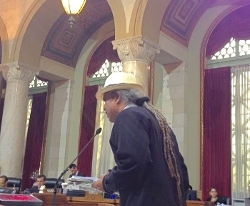 On December 6, 2011, the Los Angeles City Council unanimously voted to extend the City's Foreclosure Eviction Ordinance to protect tenants Living in rental properties not subject to the City's Rent Stabilization Ordinance (RSO) from eviction on the grounds of foreclosure for another year. This Ordinance prohibits lenders from evicting any tenants in the City merely because of foreclosure on their landlords. Tenants living in rent controlled units have had these protections. 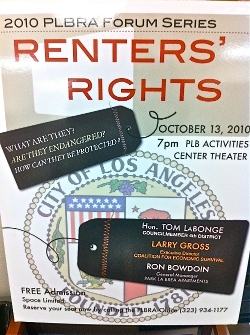 The Los Angeles City Council voted Tuesday, October 21, 2011 to increase rent control and code enforcement fees. More importantly the Council voted down, 8 to 5, a proposal by Council Members Richard Alarcón and Ed Reyes to evenly divide the code enforcement fee to alleviate the financial burden on tenants who, for the most part, can least afford to pay the full and increased fee. While tenants groups were not opposed to the fee increases, which will prevent a deficit and enable the Housing Department to maintain its current operations and services, they were opposed to the inequity in who pays the Systematic Code Enforcement Programs (SCEP) fee. Currently, landlords can pass on the full SCEP fee to tenants. 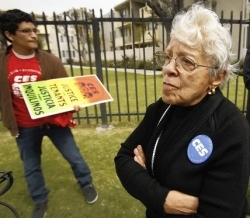 The tenant groups were urging that the SCEP fee be split 50/50 between landlords and tenants similar to the Rental Unit Registration fee, which was reflected in the Alarcón/Reyes proposal. 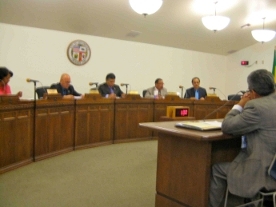 The Los Angeles City Council Housing Community Economic and Development (HCED) Committee held hearing Wednesday, October 12, 2011 to discuss a proposal from the Los Angeles Housing Department (LAHD) to increase rent control and code enforcement fees. 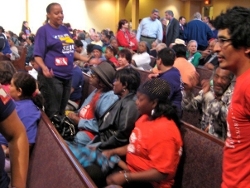 The hearing room was packed with tenants and landlords and their representatives who testified on the proposal. While tenants groups were not opposed to the fee increase, which will help continue the crucial operations of the Housing Department, they were opposed to the inequity in who pays the SCEP fees. Currently, landlords can pass on the full SCEP fee to tenants. The tenant groups were urging that the SCEP fee be split 50/50 between landlords and tenants similar to the Rental Unit Registration fee. 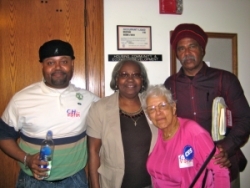 (Left to right) CES Tenant Organizer Joel Montano, Westminster Villa tenants Triana Williams, Ann Williams, and Aderemilekun Adewole. A delegation of tenants living in the 12-unit Westminster Villa HUD subsidized apartment building in Venice meet with the staff of Los Angeles Council Member Bill Rosendahl to ask for their representative’s support in helping to preserve their affordable housing. The owner of their building is attempting to illegally ‘opt-out’ of a project-based Section 8 rent subsidy control by not providing the require notices under state law. 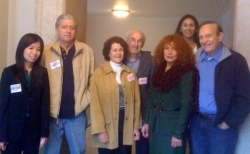 Tenants came away from the August 25, 2011 meeting optimistic having achieved their meeting goals. On August 18, 2001, loud and determined chants filled the intersection of Wilshire Blvd and Western Ave. in Los Angeles’ Koreatown. As the weeks turn into days, and the days turn into hours, the clock continues to count down on what could be world wide economic Armageddon. 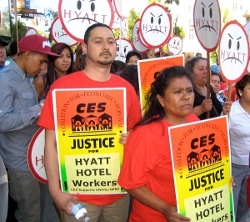 On Thursday, July 21, enthusiastic members and supporters (including Coalition for Economic Survival members) of UNITE HERE Local 11 gathered on the famous Sunset Strip outside of the Hyatt Andaz West Hollywood to show support for Hyatt workers, particularly the housekeepers. CES Supports April 4: National Day of Solidarity with Wisconsin and a Tribute to Martin Luther King, Jr. In an effort to build community awareness and solicit community support, the Coalition for Economic Survival (CES) together with UNITE-HERE Local 11 and Stonewall Young Democrats, held a community meeting in West Hollywood to discuss the recently called boycott of Hyatt Hotels, particularly the Hyatt Andaz West Hollywood on the famed Sunset Strip. They're in the news almost every day. They’re bed bugs and the infestation of these nasty pests are growing from one end of the country to the other. On July 27, 2010 representatives of Los Angeles 10th District Council Member Herb Wesson, visited CES tenant leaders at Park Norton Apartments in the Arlington Heights area of Los Angeles. But Victory is Incomplete As City Council Votes To Deny Freeze to Tenants in Building With 5 Units or Less! 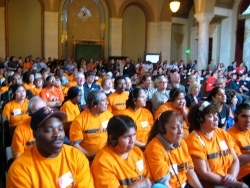 Tenants and supporters from various tenants' rights organizations and labor unions packed Los Angeles City Hall last week, in support of a motion by City Council Member Richard Alarcón to freeze rents for 4 months with a possible 2 months extension to enable the City Council to finish its work of possibly making long-term changes to the city's Rent Stabilization Ordinance (RSO). The Council voted 8 to 6 to support the freeze, but ended up including amendments that weakened its impact. 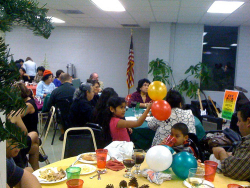 A great time was had by one and all at the Coalition for Economic Survival Holiday Party, held on December 17, 2009 with the Healthy Homes Collaborative. 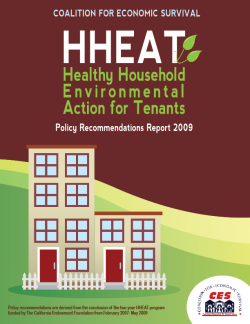 CES is a member of the Healthy Homes Collaborative. The severe impact of the US housing crisis on low- and moderate-income people has become so great that even the United Nations decided the situation has warranted an investigation. As a result, the UN dispatched a Special Rapporteur on the Right to Adequate Housing, Raquel Rolnik, on a multi-US city fact-finding mission. CES, together with our tenants’ rights and affordable housing organizational allies, participated in a number of events hosting Ms. Rolnik, which included a Town Hall meeting and a site visit tour of Los Angeles to view slum housing, subsidized housing, skid row, gentrifying communities and non-profit affordable housing. 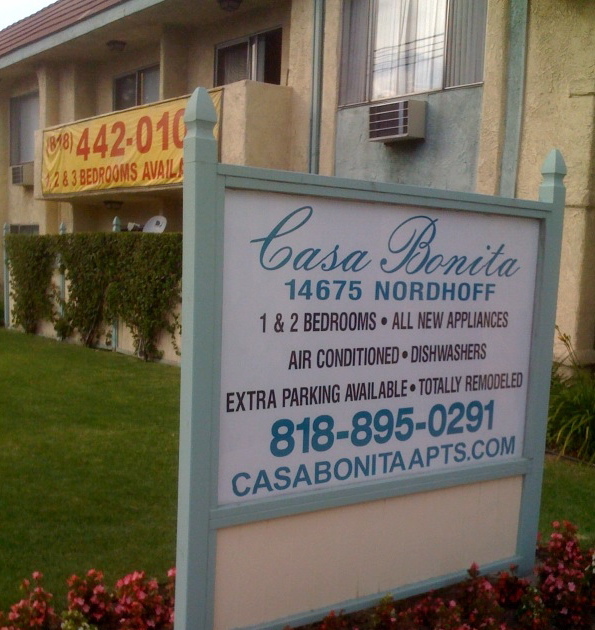 On October 13, 2009, the LA City Council unanimously voted to uphold the recommendation to deny a condominium conversion application of a 104-unit rent controlled apartment complex in Sherman Oaks. The City Council vote marked the end of another chapter in an over decade-old fight with four different landlords to stop tenants from being displaced, and to prevent this affordable housing from being lost. 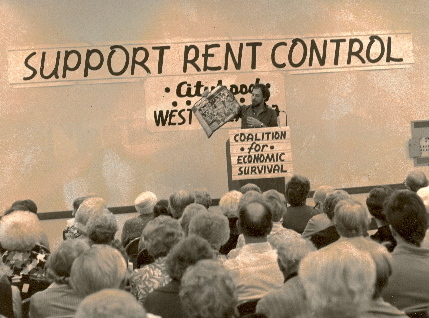 During this time, the tenants fought and won other landlords' attempts to evict them and/or raise their rents. 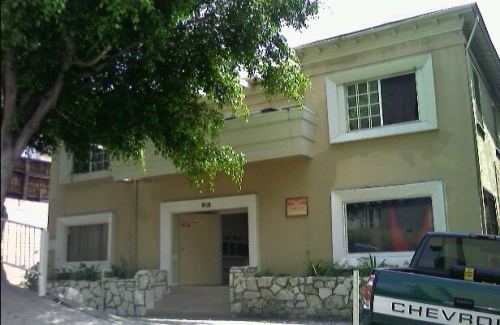 CES scored another victory when the Los Angeles City Council, at its March 4, 2009 meeting, unanimously voted to deny a developer’s appeal and upheld a Planning Department recommendation to deny the condominium conversion of a 30 unit rent controlled apartment building in the Panorama City area of the San Fernando Valley. 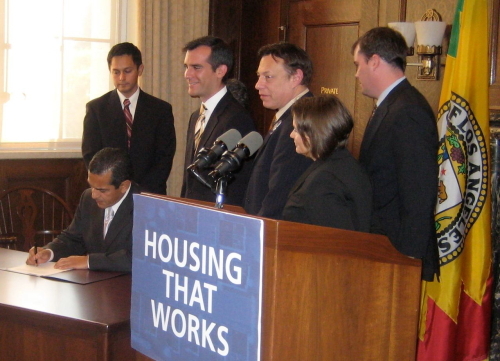 On March 2, 2009, the right of many L.A. HUD Subsidized tenants to be able to remain in their affordable housing was argued before the U.S. 9th Circuit Court of Appeals. 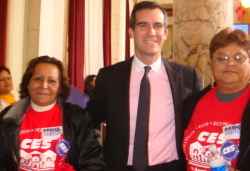 At LA City Hall, LA City Council President Eric Garcetti joins with CES Tenant Leaders Ana Maria Valencia (left) and Rosa Hilda Archila (right) to celebrate new approved protections for tenants facing "Good Faith" evictions and living in foreclosed rental properties immediately following the City Council's unanimous vote on December 17, 2008. 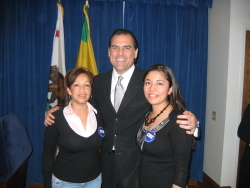 (left to right) CES Tenant Organizer Felipa Soto, L.A. City Attorney Rocky Delgadillo, CES Tenant Organizer Sua Iris Hernandez after a news conference held on December 15, 2008, announcing the free holiday toy testing and exchange event throughout the city sponsored by the L.A. City Attorney's Office. The Coalition for Economic Survival (CES) worked with the City Attorney's office and other allied Healthy Homes Collaborative organizations to address unsafe toys that have lead in them. A one day free toy testing and exchange event was held on Saturday, December 20 four different location throughout the City of Los Angelels. CES and other Healthy Homes Collaborative groups helped to publicize the event and increase participation, as well as helping to staff the testing location. This was important opportunity to help ensure that the toys kids receive during the holidays are safe and does not contain dangerous lead levels. June 2004. 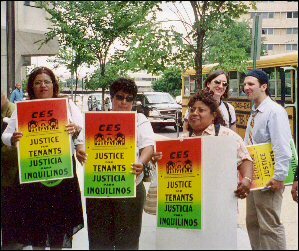 CES tenant leaders participate in a protest outside the headquarters of the U.S. Department of Housing and Urban Development (HUD) in Washington, D.C. 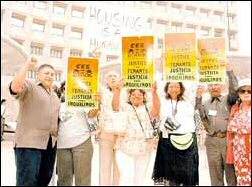 The action was protesting the Bush Administration's severe cuts to the nation's affordable housing and rent subsidy programs. 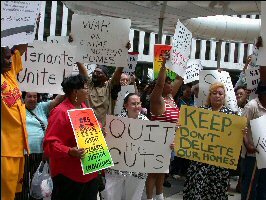 The demonstration was sponsored by the National Alliance of HUD Tenants (NAHT), which CES is affiliated with. It was part of the activities of NAHT's annual Save Our Homes Conferences attended by hundreds of HUD tenants from throughout the nation. June 2004. CES members and other tenant leaders from across the nation speak out against cuts to the Section 8 rent subsidy program and other affordable housing funding outside HUD Headquarters. June 2004. 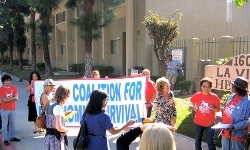 CES members, who are leaders of the Hollywood West Apartments Tenant Action Committee, a complex owned and controlled by HUD tenants, join the protest outside HUD Headquarters. May 2004. 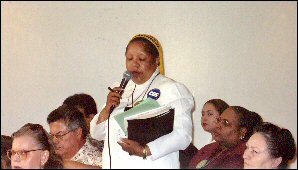 Gilbert Lindsay Manor Tenant Association President Pastor Joyce Chapman, a key CES tenant leader, questions HUD officials at a HUD Tenants' Eyes and Ears meeting, held in conjunction with the Annual Housing California Conference in Sacramento. May 2004. 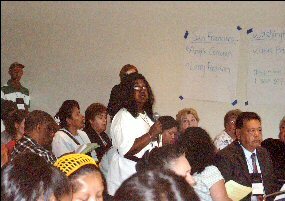 CES tenant leader Cora Parks, a resident in a HUD subsidized building, Holiday 101A Apartments, located in South Los Angeles, confronts HUD officials at a HUD Tenants' Eyes and Ears meeting, held in conjunction with the Annual Housing California Conference in Sacramento. May 12, 2004. 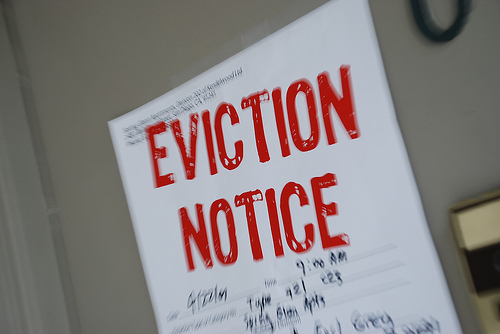 The L.A. City Council unanimously voted to increase relocation assistance to tenants covered by the City's Rent Stabilization Ordinance facing 'no fault' evictions. This is a tremendous victory for tenants and tenant advocates. 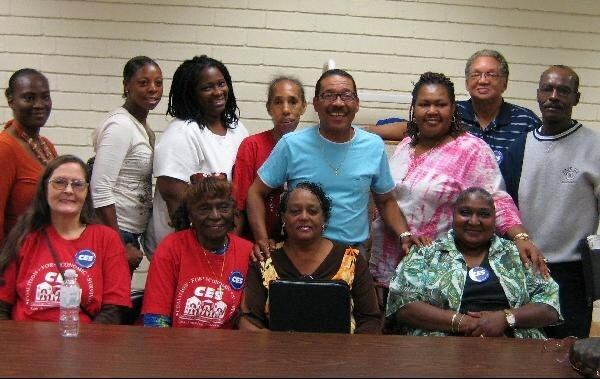 Approximately 30 CES tenant activist member attended the Council meeting. 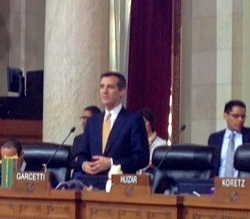 The ordinance was proposed by Councilmember Eric Garcetti. The increase for "qualified" households (seniors, disabled and those with dependent children) goes to $8,000 from $5,000 and $3,200 from $2,000 for other households. 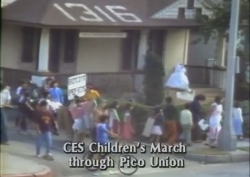 CES was last successful in securing a relocation assistance increase was in 1987. At that time, the City Council assured CES and tenant activist that it would look at the amounts three years after for the purpose of adjusting the amounts based on the impact of inflation. Sixteen years after the last increase and 13 years after the Council was to look at adjusting the amounts again, relocation assistance amounts were increased. Just another example of the wheels of government moving slowly. 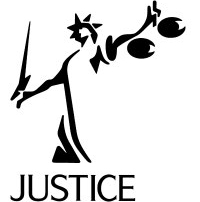 Nevertheless, this is a great victory for tenants that brings us a little bit closer to securing just compensation for displaced tenants. January 22, 2004. 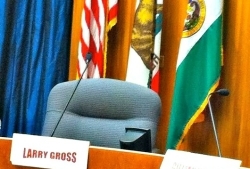 CES Executive Director Larry Gross gives a presentation to housing Deputy staff of Los Angeles City Council Members on issues pertaining to the preservation of private and HUD subsidized affordable housing. 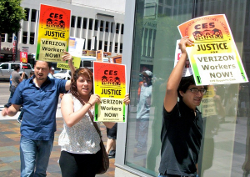 The session was organized by Call to Action, an alliance of 45 tenant rights, affordable housing, homeless and legal aid advocacy group in the L.A. area, which CES is a member of. Other issues presented by other Call to Action members included urging positions to enhance and protect rent control, public housing, the city’s Housing Trust Fund and residential hotel housing. January 2004. CES member contingent marches in support of striking grocery store workers. The protest held on January 31, 2004 in Inglewood, brought out 20,000 people in support of the workers. October 23, 2003. CES Tenant Organizers describes lead paint hazards and code violations at an Echo Park building CES is organizing to advocates participating on a bus tour organized by the Healthy Homes Collaborative. June 22, 2003. Former CES HUD Tenant Outreach and Organizing Coordinator Franklin Campos explains HUD's Mark to Market program, together with former CES Tenant Organizer Yuisa Gimeno at a workshop they conducted by the annual conference of the National Alliance of HUD Tenants (NAHT).